The Fool and The World are the first and the last cards of Major arcana and can be therefore considered as alpha and omega of this series. The Fool represents the eternal beginning and The World is the climax. A whole life story is set between these two poles, with wide range of possible interpretations. 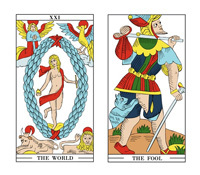 If you lay the cards side by side in order (1) The Fool and (2) The World, it is immediately obvious, that The Fool is looking in the direction of The World card, attracted by a naked woman. The Fool can be interpreted here as basic energy without deeper sense or boundaries – the energy, that has not yet been clearly defined. This energy is looking for its application. If the Fool remains alone, he is exposed to the risk of endless wandering through the world with his stick. If he will not direct his creative energy to some specific objective, it could aimlessly run out. From this perspective, we can see The World card, framed by four elements, as a mental and physical fulfillment of Fool's life energy. As his destination. The order of the cards is essential. 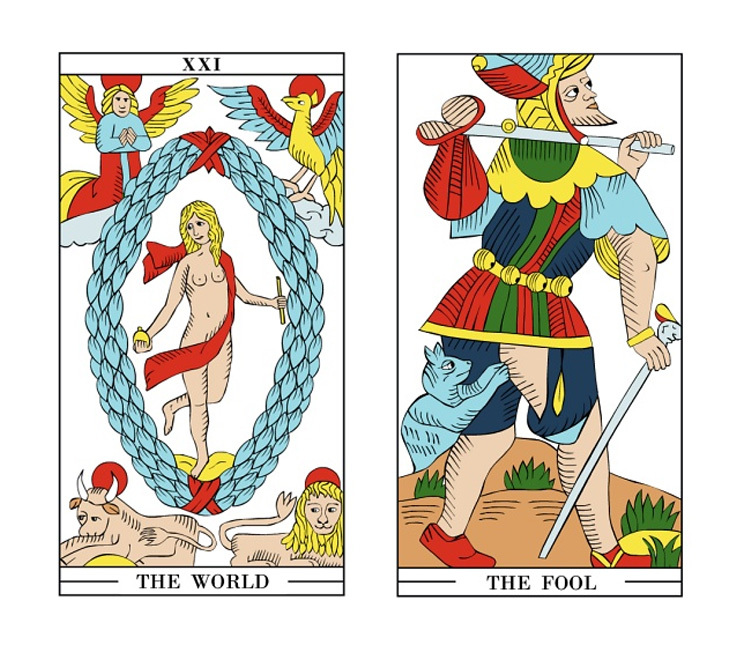 If the cards are placed next to each other in reverse order (1) The World and (2) The Fool, the situation is quite different. 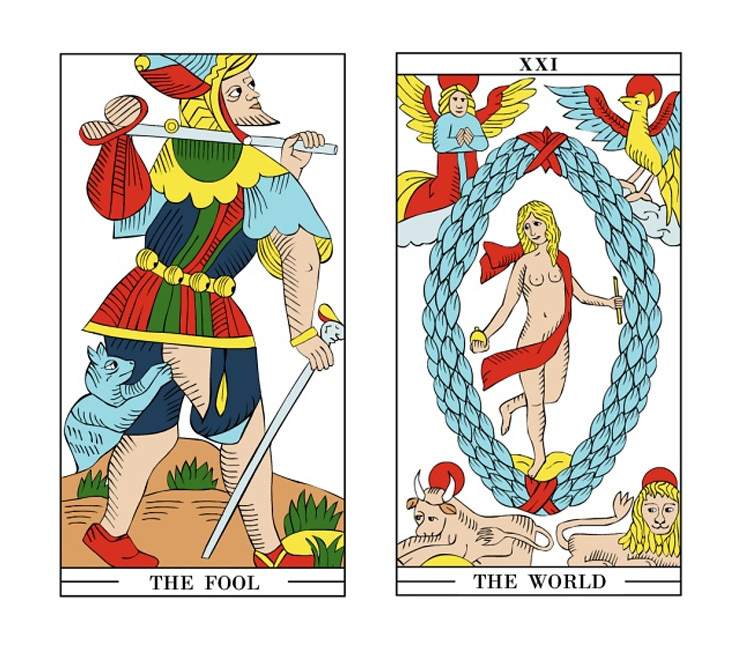 The World card is not a fulfillment of anything but becomes a prison (blue oval wreath is a bond or cage), with the figure of a woman desperately staring at the emptiness in her past (there is no other card to the left). This is a difficult beginning, and the only solution seems to be liberation. 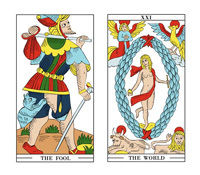 The Fool card represents an escape from these bonds. However, this is a difficult experiment, because there is no other card in front of The Fool, that would direct his destination. This simple example of relocated cards allows us to see that card meanings are not clearly given. Therefore, the order of the cards during the card reading is crucial and helps us find the right message. Those, who created tarot cards centuries ago, equipped them with inscriptions in Latin or French. And these card names give us the advice how to interpret them – in the same direction as we read and write. From the left to the right. Thus we can imagine some kind of a timeline on which the cards can be placed side by side. Those on the left represent the past, the middle part is close to the current state and those on the right represent the potential of the future, which may or may be not fulfilled. This article is based on the chapter "The Fool and The World: Spatial Organisation of the Tarot" from the book: Alejandro Jorodowsky: The Way of Tarot, Destiny Books, 2009, page 38. This book can be warmly recommended to all those who are interested in deeper studying of tarot card reading.